I almost wet myself the other night when I realized that my favorite sugary drink the Coolatta comes in grape now! i know it's late and I haven't slept much, but could this be real? a grape coolatta? this has to be a dream! I was so confused I actually asked if the menu was right! I love Strawberry Coolattas: sugary, icy, and a nice flavor with bits of what appears to be real strawberries. Could this same greatness come to grapeness? Well it sure looks official in that cup, but for some strange reason, the flavors of grape and watermelon are in a different font then the standard menu flavors of strawberry and Tropicana orange. hmmmmm. how odd. Who cares really, I couldn't wait to try it. I take a taste and it reminds me of ....a grape freeze pop. it's not bad, and I'm really thirsty, but I can't say it has that usual coolatta quality about it. Talk about setting your expectations way too high. Update: I haven't been had after all!! I just happen to stumble upon a store test marketing this cheesey new beverage! 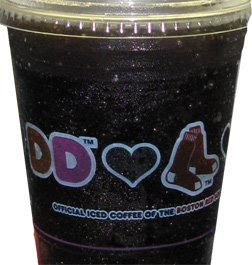 Grape Coolattas are now an official yet unsatisfying part of the Dunkin Donuts Menu. Maybe I'll try another one some time, but why would I want to when I have the oh say tasty Strawberry to run with? (I just had one two days ago and it was as tasty as ever). Update 2011: The grape coolatta is long gone. I want to say they survived for the 2010 season, but I'm not even sure anymore. Seems like all the new fangled flavors are poorly thought out and have the life span to prove it. I just don't get why they don't put more effort into these things. Yes- I said the same thing- a freeze pop. I wasn't expecting yummy bits of grape though since it is deep purple.